Greenville’s Andrew Stachler was crowned the 106-pound champion on Saturday in the Greater Western Ohio Conference tournament held at Vandalia Butler. Greenville’s Jacob Mikesell won his 152-pound match to capture third place on Saturday in the Greater Western Ohio Conference tournament held at Vandalia Butler. 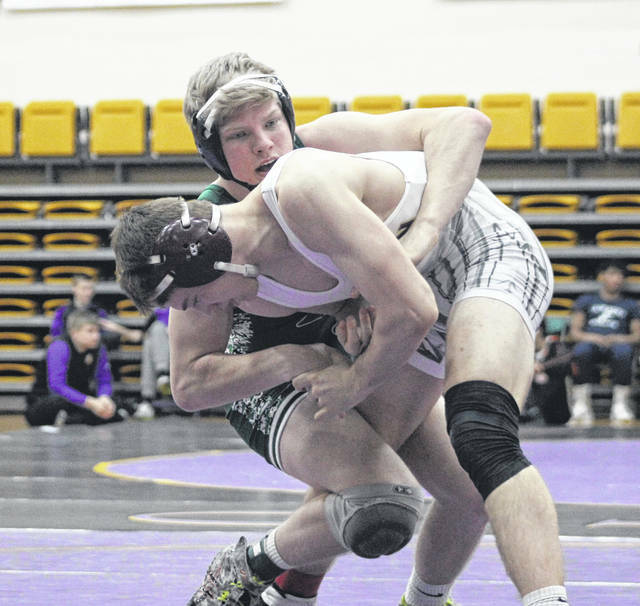 Greenville’s Logan Thatcher was one of three Wave wrestlers to compete in the finals on Saturday in the Greater Western Ohio Conference tournament held at Vandalia Butler. Thatcher lost his fifth-place match to finished sixth overall at 120 pounds. 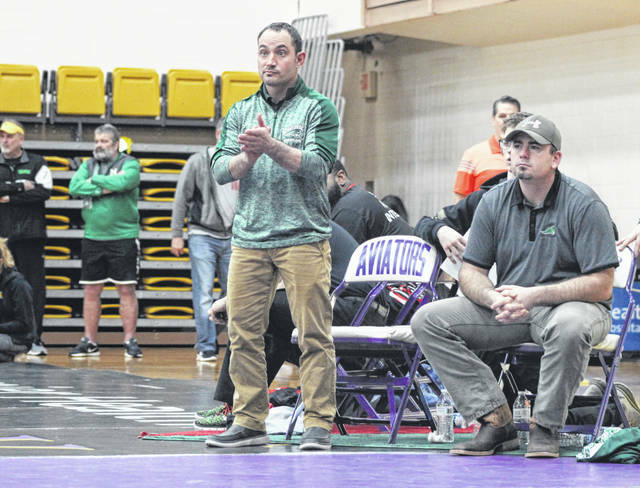 Greenville coach Dave Guillozet claps for Logan Thatcher during his 120-pound match for fifth place on Saturday in the Greater Western Ohio Conference tournament held at Vandalia Butler. 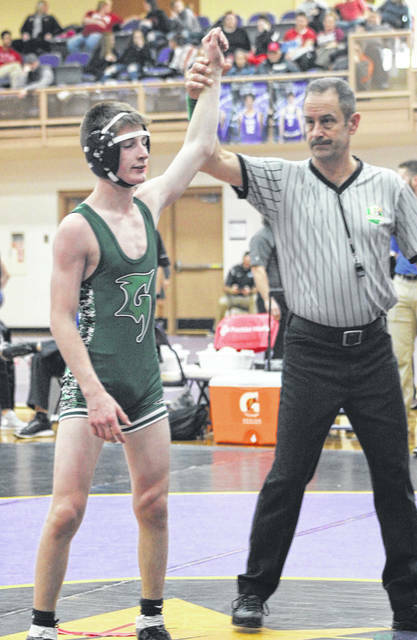 Greenville’s Andrew Stachler has his arm lifted in victory as he was crowned the 106-pound champion on Saturday in the Greater Western Ohio Conference tournament held at Vandalia Butler. VANDALIA – For the first time in six years, Greenville has a Greater Western Ohio Conference wrestling champion. Junior Andrew Stachler defeated Springboro’s Hayden Hollis by an 18-4 major decision on Saturday to win the 106-pound weight class title. Along the way to the finals match, Stachler won his first round match over Centerville’s Simon Taylor by pin at 2:40. In the second round he beat Tippecanoe’s Elliott Abrams by tech fall 20-4, then in the third round he earned a pin win over Troy’s Zach Evans at 1:46 to reach the championship match. “Andrew set out to do that and he was very impressive in all his wins,” Greenville coach Dave Guillozet said of Stachler, who is now 31-4 on the season. “He went out and dominated all his matches and I am very proud of him. He worked his tail off and wrestled well. But Stachler wasn’t the only ‘first’ for Guillozet at Saturday’s tournament. Freshman Logan Thatcher was among the three Greenville placers at the event and that is a first for Guillozet as well. Thatcher battled hard in the fifth-place match with Fairmont’s Drew Altick, but lost by an 8-6 decision after six minutes to finish sixth overall. Thatcher lost his first round match on Friday to Charlie Blanton of Stebbins by pin at 4:26 dropping him to the consolation bracket where he fought his way back to the fifth place match. In his next match, Thatcher defeated Miamisburg’s Kaelon Lawson-West by a 3-2 decision and then beat Springfield’s Kirsten Nye by pin in 34 seconds. He was then pinned by Trotwood-Madison’s Amir Harris at 2:44 putting him in the fifth-place finals match. At 152 pounds, Jacob Mikesell was the other Greenville wrestler to compete in the finals. He faced Lebanon’s Tyler Grogg for the second time in the tournament and won a narrow 8-7 decision to capture third place on the podium. After winning his first round match over Fairborn’s Peyton Robinson by pin at 4:50, Mikesell then faced Grogg for the first time in the tournament and lost by an 8-3 decision sending him to the consolation bracket. In the consolation bracket, Mikesell first defeated Jonathan Lawrence of Stebbins by pin at 4:29, and then defeated Bobby Robbins of Fairmont by a 7-4 decision. Mikesell needed to win one more match to get to the third-place finals and he did that by taking down Adam Auttelet of Centerville in 2:47. That earned him the rematch with Grogg, which he won 8-7. “Jacob came back after losing to that kid in the second round on Friday,” Guillozet said. “He fought his way back through the consolation bracket where he wrestled really well and wrestled some good matches and he beat the kid that beat him yesterday, so that obviously shows what his attitude was. He wants to continue to get better. As far as team standings go, Greenville didn’t have a great day with several wrestlers not competing for various injuries. The Wave placed 13th overall out of 20 teams with a score of 62.5 points. The top six schools – Springboro, Beavercreek, Centerville, Butler, Fairmont and Lebanon all had more than 100 points with Springboro winning the team championship. It is the last time Greenville will compete in the GWOC tournament as they will join nine others school in the Miami Valley League for the 2019-20 school year. ”We gave up five weight classes today so the team didn’t actually do too well,” Guillozet said. “But even though we had a couple of tough rounds the boys worked hard and they didn’t give up.